As you can see, subsurface scattering is nowhere to be seen in this node setup. The key here, besides the complex combination of several procedural textures, is substitution the glossy shader for the anisotropic shader to get the reflectivity, and then plug per shader bump mapping in the anisotropic only, instead of both the anisotropic and the diffuse shader. You might think that something similar could be achieved using the glossy shader, but the in my experience, anisotropic gives off a more subtle gloss the is easier to tweak for good results. Update v1.1: Since anisotropic is very much WIP at the moment, I’ve decided to replace it with a simple gloss material, which is capable of achieving the same visual effect in this context. This will make the material more future proof, and has enabled me to simplify a bit the controls. Update v1.2: Recent changes in the the way the bump node works had broken this material. This update fixes that problem. 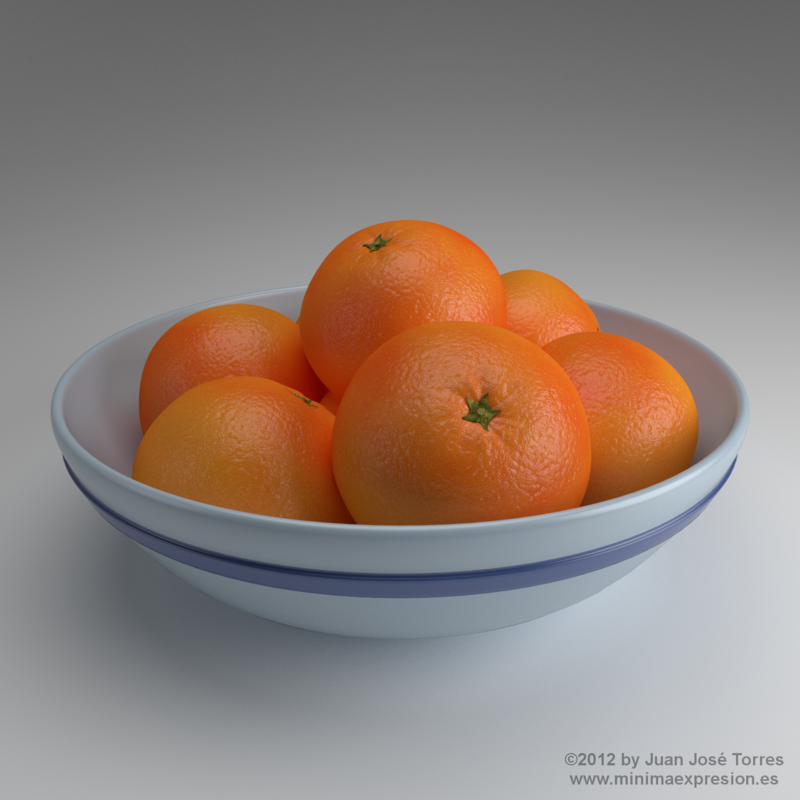 Posted in Surface Knowledge and tagged blender, cycles, materiales, materials, naranja, orange, orange skin, piel de naranja, procedural. Very nice indeed. Thank you for sharing your knowledge. 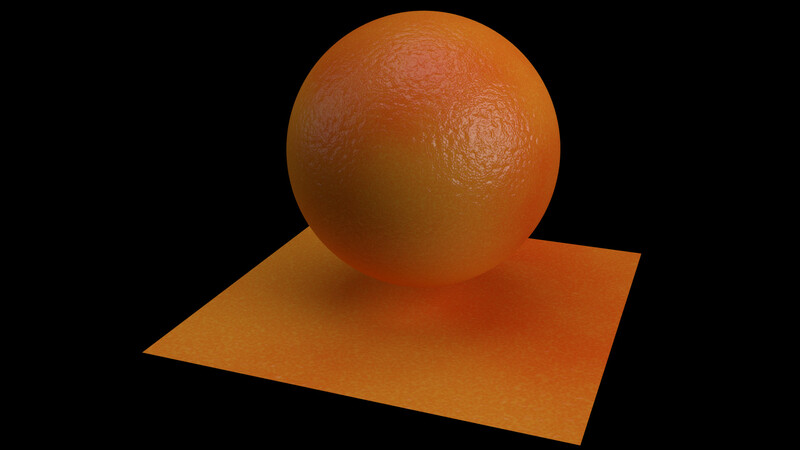 That’s a pretty damn good orange skin material! Good job and thanks for the .blend! Thank you, Andreu. Just let me know if you do something interesting with it. I usually get back to my materials and refine them from time to time, so I could have updated versions available in the future. I’m also working on new materials wich I will be releasing in the comming months. Awesome buddy, currently i am working on a Orange but i could not find perfect texture, i am working on maya so can u pls upload maya tutorial or shader or atleast texture.. pls ..
your work is just awesome…. Sorry, I don’t work with Maya. Also, textures used in this material are not bitmaps, but Cycle’s own procedural textures, so there is nothing for me to upload besides the blend file already available. You might try to open the file in blender an study the way it works. With a bit of luck you might reproduce it in Maya. Wauwww! !,,,,Muchas gracias. Precisamente estaba buscando la forma de hacer una buena textura para frutas. Esto también sirve para hacer limones, limas, etc. Muchas gracias por el material, justo lo que buscaba. Magníficas también tus otras creaciones.